Cisco has now added a menu tree on the left side of the page. 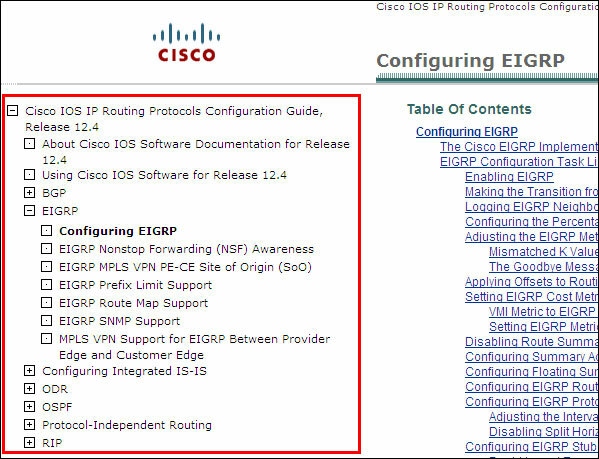 This is a very handy addition as it means that I can get to all of the IP Routing configuration guides from a single page. No more backing my browser up when I want to move to BGP or RIP commands. I’ve been seeing this menu tree on a number (but not all) of the documentation pages. Hopefully they will all be built by the time that I take the lab. The issue lies in the way ISPs share Border Gateway Protocol (BGP) routing information. BGP is the standard protocol used by routers to find computers on the Internet, but there is a lot of BGP routing data available. To simplify things, ISPs share this kind of information among each other. In San Francisco, David Ulevitch first noticed the problem Saturday morning. “I was trying to watch cats falling off roofs… and I couldn’t get to YouTube,” he said. I’m making yet another pass through the IEATC and Routing TCP/IP books. I’m trying to consolidate my notes into a streamlined set of documents for study. One thing I am interested in doing is creating a set of questions so that I can take some time every day to quiz myself on stuff that I need to know by heart for the lab exam. If anyone has any suggestions as to a program in which I can create test banks with multiple choice questions please leave a comment with the software name (and URL if possible, but I can always google that). I’m looking for something simple. I don’t need to share the tests out via the web or allow access to multiple users. I am using Windows as my OS. Ideally it would allow me to create questions and classify them by technology. It would be great if it could score tests, but that’s not a deal breaker. I would also like to be able to associate images (jpegs of network diagrams) with questions. I’m also looking for something under US $50 with freeware being my optimal price-point. 🙂 I’m not interested in any warez or cracks. 1) In configuration mode and forgot to type “do” before my command. 2) I was in enable mode and accidentally typed “do” before my command. I also choke on typing “conf t” quite a bit. This is generally when I’m trying to type too quickly. For whatever reason my fingers seem to want to type a space after the ‘n’ (“con ft”). I usually don’t blog about vendors’ sales, but IPexpert is currently (ending soon – 29 February) running a offer that includes their workbook, proctor guide, Video On Demand class, and audio class for $599. That’s a very good price. I guess that they have been running this promotion since the beginning of the year, but it’s ending soon. Begins with individual protocol- and technology-focused scenarios to build your understanding of the foundation topics in the CCIE Lab blueprint. Graduates into full-day “mock lab” challenges to give you the feel of the real lab exam. Access the configurations for each lab, so you can check your work. Learn more about the CCIE Workbook and Proctor Guide here. Provides walk-through explanations to the Workbook labs! Unable to attend a live classroom training? This recorded Video on Demand lecture series provides in-depth discussions of the lab blueprint topics. Recorded by the renowned instructors at IPexpert. This is an EXTRA value of $899-999 you get for free! Learn more about the CCIE Video on Demand DVDs here. This is the perfect way to keep learning while you are driving, exercising or just relaxing. Listen to in-depth lectures on the CCIE Lab blueprint topics. Recorded by our CCIE-certified experts! This is an extra value of $799-899 you get for free! Learn more about CCIE Audio Boot Camp CDs here. Promotion valid for all new orders, not to be combined with any other offers. Limited time offer. Subject to change or discontinuation without notice. Order must be paid in full by 5:00pm Eastern Time, February 29, 2008. During the checkout process, simply enter coupon code “CCIEpursuit” for an extra $25.00 discount that will be applied instantly. That’s pretty cool. Of course you only have a few days left though. Disclaimer: I am not affiliated with IPexpert in any way. I am still working on my next set of CCIE Blogs. I hope to get it done this weekend, but work has been a real bear this week. In the mean time I want to spotlight a couple of sites that recently sent me some “link love”. First up is ardenpackeer.com. Arden has what I would consider a dream job: he’s a Senior Technical Instructor in beautiful Melbourne, Australia (#2 on a very short list of countries I would love to live in). He has been pursuing the Routing and Switching CCIE since July of last year and it using Internetwork Expert materials. He’s set to take the lab in May. As you would expect from a professional instructor, his site has a wealth of well written training material from a QoS Mindmap to using NBAR and QoS to filter websites to setting up backup interfaces. It’s pretty cool to find out that someone that you’ve been reading for years has read your site as well. I’ve been subscribed to David Davis’ Cisco Routers and Switches at TechRepublic (may require a login) for a few years now. I read his column every Friday. He also has a personal site at HappyRouter.com as well as a blog at IT Knowledge Exchange. He recently sent some “link love” (that’s where I got the term from) my way as well as Ivan Pepelnjak’s outstanding Cisco IOS Hints And Tips blog. Bitbucketblog recently got his CCIE number in Routing and Switching. The CCIE bug must have bitten him pretty hard or he’s a glutton for punishment because – after mulling over whether to pursue the Security or Voice track next – he’s decided to pursue the Service Provider track instead. Ethan Banks is in the middle of Micronic’s boot camp in Pasadena this week and he’s blogging his experience. It looks like Darby Weaver (who is probably familiar to anyone who reads GroupStudy) is there as well and is posting about the experience here. Do you find yourself wanting to start pursuing a CCIE certification but are overwhelmed by the different options you see and don’t know where to start? Wouldn’t it be great to first test your knowledge and ensure you are purchasing only those training materials that will most benefit you, while at the same time avoiding what’s unnecessary? Well look no further than our new CCIE Assessment Exam coming in March 2008. Internetwork Expert’s CCIE Assessment Exam is a two part evaluation designed to custom tailor your path to obtaining the CCIE certification. In the first part of the exam you will be provided a self-evaluation survey with a special set of qualification questions designed to help you diagnose where you stand in relation to lab exam study needs. Based on your answers to the self-evaluation you will be assigned a specially-tailored practical lab exam that you will configure on our equipment through our GradedLabs® rack access system. Once completed with the practical lab exam you will immediately receive a graded score report that provides specialized and customized product recommendations for you based on your individual results. With this method of custom evaluation you can eliminate any guesswork involved when choosing which study materials are right for you. The cost for the CCIE Assessment Lab for new customers is $59, however once completed you will receive this full amount back as a store credit towards the purchase of any training materials that are recommended to you. This essentially makes our new CCIE Assessment Lab ABSOLUTELY FREE! It looks like new customers will fill out a survey and then take a mock lab. Based on the results of that lab IE will recommend training materials for your study. Even if it is just a complete sales pitch (“Based on your results you need to buy everything we offer.”) it is still amounts to a very inexpensive graded mock lab for new customers. If you decide to buy any IE materials, then you get to apply the $59 towards that purchase. Hi CCIE Pursuit, I couldn’t find a contact address for you so I am posting my message here. I wanted to let you know that your site is one of Network World’s 20 useful sites for Cisco networking professionals http://www.networkworld.com/community/node/25115. Linda Leung, Network World Assistant Site Editor. I was pretty excited to see my blog make the list (I’m on page 18). That is, until I found out that CCIE Journey had made the cut as well. The bar must be set very low for him to make it in. 🙂 Just messing around. Mad love to CCIE Journey. If they include hellos, then we need to configure the the point-to-point FR connection as a demand circuit. “ip ospf demand-circuit” only needs to be configured on one side of the link. So I need to get rid of Summary Net Link States (LSA 3). How to do this? Type Keyword LSAs Default Injected? This was a pretty basic EIGRP configuration with one exception. r1, r2, and r4 form a Frame Relay hub-and-spoke network. r1 and r2 (spokes) are running EIGRP, but EIGRP is not enabled on r4 (hub). Consequently, r1 and r2 are not peering though the Frame Relay cloud. Can I disable EIGRP split-horizon on r4 even though it’s not running EIGRP? r4(config-subif)#no ip split-horizon eigrp ?